*Note: McFatty Mondays is no longer!! Instead, I will be posting Momma's Monday Check-in. Join me as I eat and exercise my way through the next 35 weeks. Morning Sickness: I feel fine so far, which makes me a little nervous! I won't complain though, I know I should try to enjoy this while it lasts. Cravings: Not really a craving per se, but these bars make for a very satisfying chocolate fix at only 100 calories and with three grams of fiber. Sleep: Now that Roscoe sleeps through the night (yay! ), I get 7 to 8 hours of solid sleep. His timing couldn't be better. I still cannot make it through the day without an afternoon nap. I can't live without: My Mom Agenda--I heart agendas and this one combines all my must-have features! I'm already penciling in the important stuff, and my lists of new baby to-dos are growing by the minute. I miss: Walking upstairs without getting winded. I am looking forward to: Little Sears's heart starting to beat this week! Aha Moment: Our insurance covers home birth, which should save us some money. That's good news! Milestones: I had one itty bitty bout of heartburn, which could have been the tomato soup I ate for dinner that night...but I chose to blame Little Sears. I bought this pregnancy's FIRST bottle of Tums!! Best moment this week: I cleaned out and organized my closet to make way for my yet to be cultivated maternity wardrobe. 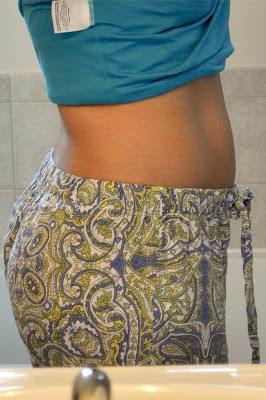 Workout Recap: My capacity to workout changes dramatically during pregnancy, especially in the first trimester. I like to use the rate of perceived exertion to monitor the intensity of my workouts. It's a relative scale and no matter if I'm pregnant, I like to work somewhere between a 5 and 8. I already feel more winded and less able to perform at the gym, and while it's tempting to give myself a break right now, I know I'll feel better (and stronger) in the long run if I just hang in there. This phase of general weakness should pass in the next month or two. I did too much walking last week, and not enough kickboxing! Diet: I had a few days last week when I was really tired, and feeling under the weather due in part to a summer cold. When I'm tired I'm lazy, and it can be difficult to want to take time to create healthy meals and make smart food choices. I've found that cooking meals large enough for leftovers can be a big help, as well as keeping a lot of fresh fruit and lean protein sources at hand. Lately it's been chicken breasts, sliced deli meat off the bone, string cheese, pistachios, and egg beaters. Since I'm still nursing Roscoe I'm taking a calcium + vitamin D supplement twice a day to protect my bones. Goal's for the upcoming week: My goal this week is to continue with our daily walks/runs, and to figure out how to find extra time to lift weights at my second gym. More kickboxing!! I also need to inventory my first trimester "maternity" wardrobe and make a short list of items that I want to buy. Had to laugh about the Tums, I couldn't believe how bad and how quick I got heartburn when I got pregnant. I realized two weeks after I had Madame not one bout of it and we had made a spicy Indian and Thai in the first two weeks. Ugh, me too!! I ate SO many bottles of Tums with Roscoe it was not pleasant!! So far this pregnancy is totally different from my first, so maybe that will bode well for the heartburn issue! I am seriously so proud of you for keeping up the workouts. I was a useless blog in first tri. Okay, I was a useless blog in all trimesters.